Joel Berkley and Justin Hawkins are the highest qualifiers after the opening night of competition, at the MIXXFM, Speedway Sedans Australia, National Production Sedan Title, Western Speedway, Hamilton. On a drama filled night, Berkley who was also the highest qualifier after the opening night, at last seasons National Title is tied with Hawkins, with the duo being seven points clear of Richard Cook, while Gemma Laidlaw is a further seven points behind in fourth place. The drama started in the very first heat and continued to the very last, with defending Champion Trevor Mills not even completing a lap, before retiring to the infield and was not seen for the remainder of the night. He would be joined on the infield soon after by Rod Musarra, a former National Champion, also mechanical issues. Steven Aldridge joined the pair on lap six after the steering broke putting the Victorian into the fence. Meanwhile, newly crowned Victorian Champion, Beau Riley from Western Australia, was able to take the win, defeating Ray Ussher and Wayne Bourke. 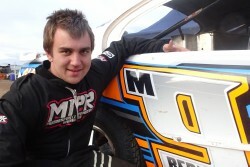 Kane McDiarmid was involved in an early incident not of his doing, which subsequently saw the West Australian on the infield with fuel coming out of the back of the car, ending his race. Joel Berkley would win an exciting race after starting from position eight, but steward deemed he passed Craig McAlister on the infield, with Berkley relegated two positions. Damien McAlister also passed Craig McAlister on the last lap, giving Damien the win. Heat three looked destined to be the first heat to go the distance, but Matt Hutchisons front end collapsed, setting up a two lap restart. Jack Milthorpe was able to hold on in a desperate finish ahead of David Lord and Johnny Ralph. The final heat of the opening round did go the distance without incident as the track started to really slicken off in the sun. Justin Hawkins would lead throughout, easily accounting for Ben Barker and Rick Musarra. Jake Blight would be the big mover in the race after starting from position eleven to finish fifth. Selina Jennings was have a great battle for third in heat five, before mechanical issues saw her crash in turn one. Ray Ussher had nowhere to go, with both cars towed from the race track. Meanwhile, Stephen Brencher was able to hold off Rod Musarra, while Stephen Laidlaw finished third after starting at the back of the field. Heat six saw just one stoppage when David Lord spun on lap eight. Joel Berkley would lead from start to finish, with Donald Irving going from second to sixth in one lap, as a pack of six drivers traded places for the minor placings which were eventually occupied by Wayne Bourke and Justin Hawkins. More than half the field was involved in a multi-car pile-up in heat seven, with Monique Bailey, Ben Barker, Shona Bent, John Calderwood, Johnny Ralph and Neil Keldoulis all involved in the incident on turn one. Bent was deemed to be the cause of the incident and was sent to the rear of the field. In a close finish, Richard Cook was able to just holding off Dehne Sparrow who led the race early, with Ben Barker third. In heat eight, Jayden Edwards would lead for ten laps, but in a desperate last couple of laps the South Australian would finish a very close third, as both Kyle Sayer and Gemma Laidlaw were able to pass in the concluding stages. Heat nine would end the title for Selina Jennings who had a heavy crash in turn on, rolling the car, and sustaining significant damage. Jennings was able to get out of the car and was unhurt. Richard Cook who started on the front row was able to take the win, albeit narrowly, with Justin Hawkins second and Stephen Laidlaw third. Heat ten would be one of the best races of the night, with nothing separating Jake Blight, Pete Leonard, Gemma Laidlaw and Jayden Edwards for the first half of the race. Leonard, who was second, slipped to fourth as Laidlaw and Edwards passed the Victorian, with Jake Blight just holding them off in a very close finish which saw the three separated by just 0.371 after twelve laps. After earlier issues, Kane McDiarmid rewarded his crew with a very tough win, holding off Joel Berkley and Craig McAlister in heat eleven, with the trio moving away from the field early to set a classic three way battle which lasted to the chequered flag, with 0.944 separating the three. To end the night, heat twelve would be bookend by drama. Firstly, Kyle Sayer would rollover on turn one, ending his night, while an incident with just over a lap to go involving Shona Bent and Rick Musarra, which saw Musarra stop in turn three, as Bent took the lead, was deemed to be a racing incident, which put Musarra back to the lead on the resultant restart, much to the disgust of the crowd on hand. Musarra would hang on to defeat Bent and Ray Ussher. Joel Berkley will start from position three in heat fourteen on Sunday night, and has the best opportunity to be the highest pointscorer. Equal leader Justin Hawkins will be starting from position ten in the final qualifier. Third highest pointscorer, Richard Cook also has a tough assignment starting from position nine in heat fifteen, while Gemma Laidlaw will be off the very back in the same race from position eleven. Fifth placed Craig McAlister also will have a back row start on Sunday night while sixth placed Beau Riley will start out of six in heat thirteen, a race that also features seventh highest qualifier Damien McAlister, tenth placed Stephen Laidlaw, along with Stephen Brencher and Kane McDiarmid who are both positioned in the top sixteen, making this still a wide open title going into night two.